The history of the German Empire as colonial ruler of South West Africa (today’s Namibia) is especially closely connected with two peoples, the Hereros and the Nama-Oorlam. Whereas the centennial anniversary of the Herero-German colonial war was well remembered in the Namibian and German public minds, the war between Nama and German forces was barely touched upon. The uprising of the Namas, putting even missionaries of the Rhenish Missionary Society in danger, was not put down conclusively until 1906. Johannes Olpp was only 31 years old, when he took on sole responsibility for his first assignment as missionary to the Nama people in Gibeon in 1868. His disciple Hendrik Witbooi was only slightly older. From the beginning both were apparently connected by a strong bond of friendship, stemming from a deep faith in God and a natural scepticism against authority figures, which they both shared. As told in parts II and III of Olpp’s accounts reproduced in this book, both were rebels in nature, who basically accepted no other authority besides God. A lot of information contained in Olpp’s Article on the Missionary History of the Witbooi Tribe, originally only meant for the archives of the Barmen missionary station, has already been part of early research into missionary and colonial history. Therefore it was the editors’ intention to put these many scattered bits of data into context. 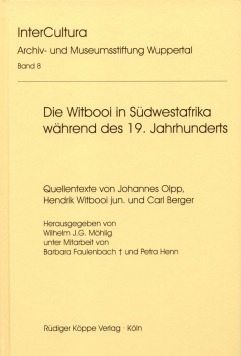 This series of the Witbooi chronicles is introduced in part I by a speech in Cape Dutch about the early history of the Witboois, held by Hendrik Witbooi jun. at the Nama Missionary Conference in Berseba in September 1900. The document is reproduced in the original Afrikaans version and a loose German translation is provided. This documentation from the archives of the UEM United Evangelical Mission centers around Hendrik Witbooi and the small group of the |Kowesi-Nama people. Therefore, in part IV, an unpublished text by Carl Berger titled Die Geskiednis van Hendrik Witbooi (The History of Hendrik Witbooi) with German translation was added in extracts. Part V contains important documents (contracts, announcements, letters by H. Witbooi), due to the vivid language partly in the original Cape Dutch version with German translations. The documents have been transcribed true to the originals, even irregularities and errors in orthography and punctuation have therefore not been omitted. Where necessary for comprehension and readability, corrections and additions have been made. To facilitate cross-referencing, an index of persons and places is annexed. Der vorzüglich ausgestattete Band bietet tiefe Einblicke in die Missions- und Kulturgeschichte der ehemaligen deutschen Kolonien.